Preserve the Olympia Farmers Market as a creative and vibrant community gathering place. Our success is dependent upon you! Contributions from the community allow The Friends to provide additional improvements to the Olympia Farmers Market, making it more inviting and comfortable for all. When you support Friends of Olympia Farmers Market, you support local small businesses, independent artisans, and organic farming. Please participate through Become a friend, Donation, Business sponsorship, QCD & Planned/giving, Items & Gifts! Please help guarantee the success of the most popular public space in Thurston County. The Taste of the Market is our primary annual event: Attending allows you to enjoy a smorgasbord of the finest cuisine from dozen’s of local restaurants, bakeries, wineries, breweries, & coffee roasters; enjoy live music, win prizes and visit with friends. 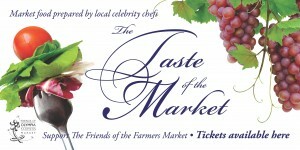 The Taste gets better every year so don’t delay in getting tickets…. as this event sells out earlier each season! There are only 400 seats available…. so hurry and get your tickets today!